Apple Products 2016 Predictions: Apple New iPhone, iPad, MacBook etc. iPhone still dominated Apple's 2015 best-selling products list in this smartphone era. 2015 was a huge success for Apple. But some analysts predicted that Apple would see a sales shrink in 2016 as Apple is losing its innovation. Will it be true? What new products will Apple bring in 2016? Below are Apple new stunners coming out in 2016. Read Apple products 2016 predictions, including 2016 Apple new iPhone (iPhone 7/Plus/6c), Apple new MacBook 2016, Apple Watch 2, iPad Air 3, new streaming TV, new iOS 10. Free download MacX Video Converter Pro to save free Hollywood Bollywood movies, soundtracks, hit singles, video clips, TV shows for offline watching on the Apple 2016 products, iPhone 7/Plus/6C, new 2016 MacBook Air/Pro, iPad Air 3/Pro. iPhone 7 is one of hotly-anticipated Apple 2016 products. iPhone 7 vs iPhone 6s, Apple new iPhone 2016 is expected to have totally new look according to Apple's traditional releases. 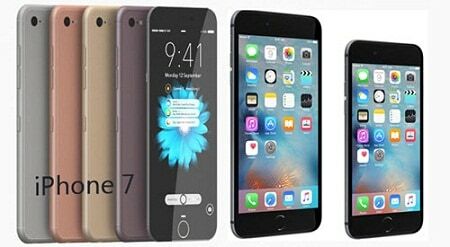 Rumor suggests that iPhone 7 will be the thinner, smaller but stronger, waterproof and equipped with edge-to-edge OLED screen. The future Apple product 2016 yet best phone 2016 may also have USB Type C, wireless charging, A10 processor, 5MP front camera, 12MP rear camera, up to 258 GB and run iOS 10. The 2016 Apple new smartphone product is reported to be the last Apple smartphone update, but will it win the iPhone 7 vs Galaxy S7 batter? iPhone SE will be on the list of 2016 Apple products. iPhone 6c will use 4-inch mini display with res of 640x1136. The Apple new iPhone 2016 is designed to replace old iPhone 5s and has improved rear camera(8MP) and A9 processor. This new product from Apple in 2016 will be available in April 2016. Read iPhone 6c vs iPhone 5s to learn more differences between iPhone 6c and 5s. New iPad Pro 2 is best tablet in 2016 by now. The 9.7-inch iPad Pro comes with A9X processor, no 3D touch, 9.7-inch 2048×1536 screen resolution display, a camera bump to 12MP. The Apple product of 2016is better for sure, but it's difficult for Apple to save the iPad sales decline. Anyway, this future Apple product from 2016 is worth buying. Apple Watch 2016 is definitely another appealing Apple products announced in 2016. The new Apple Watch 2 will feature a front-facing camera for Facetime calls, smart bracelets, better battery life and many more Apple Watch apps will be included. The 2016 new Apple watch seems more suitable for outdoor activities. Apple will unveil the upcoming Apple product 2016 in March. New MacBook Pro will hit the shelves in 2016, becoming one of the most significant Apple 2016 products. The MacBook Air/Pro is thinner and equipped with Retina display. Users will be glad to find major hardware changes from the future Apple laptop products in 2016. Performance could be enhanced . The new devices together with Apple Watch 2016 is claimed to be announced in March. iOS 9 vs iOS 8, iOS 9 brings great features. The new OS iOS 10 will be introduced in Worldwide Developers Conference in June 2016 and equipped with even more fantastic new features. with iOS 10, users may get an improved iCloud voicemail system, a much helpful weather app and camera app, better messaging app, and may other benefit from Apple product 2016 iOS 10. All the new 2016 products from Apple, like iPhone 7, iPad Air 3 etc. will run iOS 10. "The future of TV is apps". Apple launched music streaming service Apple Music 2015, and Apple product 2016 streaming TV would be the next step forward. Apple's attempt at TV revolution has suspended, rumors are flying that Apple is putting effort in streaming TV. It seems streaming TV service, along with new Apple TV and other 2016 Apple products will be released. Wanna more movies songs videos to watch offline on Apple 2016 products, iPad, iPhone, Apple MacBook Pro/Air 2016? MacX Video Converter Pro gives you chances to download free movies, music videos, TV shows from YouTube, Vimeo, Vevo, SoundCloud, Audiomack, Facebook, Dailymotion, Xnxx, and 300+ sites. Just copy and paste video URL, and click "Download Now" button. It is 100% safe and clean. In addition to downloading movies videos for iPhone 7/Plus, MacBook Air/Pro, iPad Pro/Air3, the program also works as a video converter for Apple new products 2016, helping you convert SD/HD 4K UHD videos of MTS FLV MKV etc. to iPhone 7, iPad Air 3, new MacBook Air supported formats MP4, MOV, AVI etc. with zero quality loss.